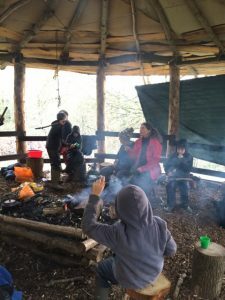 Health and safety is taken very seriously at Forest School and risk assessments of the site and activities are carried out regularly. The Forest School leader is Insured against risks and is Paediatric Outdoor First Aid trained. All staff are DBS checked. There are clear safety guidelines around Fire and Tool use. Health and hygiene are considered at each sessions in relation to food preparation and eating. Children are encouraged to take responsibility too for their own safety and of those around them, considering any risk taking such as tree climbing as a group.